The 10 Best Bars to Celebrate the New Year in California! California knows how to party when the new year rolls around. From lavish events to cozy gatherings, bars throughout California help revelers count down the New Year with various events, themes, specials and more creative offerings. Check out some of the best bars to ring in the New Year in style. Draft is a chill spot to hang out and enjoy views of the water and sunset anytime but on New Year’s Eve the casual joint on the ocean gets even better. Buy tickets in advance for one of the most affordable ways to spend NYE right on the water, complete with ball drops, DJs, drink specials and a champagne toast. San Diego’s swanky rooftop bar is super luxe spot to spend NYE. Amazing views from all over the area, super modern décor, and top notch service are all on hand. Be prepared to drop a bundle on tickets, whether you’re shelling out for your crew or just the two of you. And be sure to dress to impress. The annual New Year’s event includes several different parties on different levels of the Gaslamp Marriott. The fashionable crowd goes all out with glitz and glam as revelers dance the night away on street level and on up to the rooftop with all the views during the Bottoms Up event. If you’re looking to experience the legendary nightlife of Palm Springs, then drink and dance the night away at Zelda’s. More of a nightclub than a bar, there is always free flowing alcohol and plenty of music and NYE keeps the party going extra strong. Resident is a hybrid of spaces featuring music, food, and bars that utilize repurposed items like a trailer and fire hydrant. Frequently the perfect spot to celebrate occasions or check out new bands and great drinks, Resident is partnering with Bootie for a special New Year’s Eve event. If you can’t decide which bar to hit up, then check out the Santa Monica pub crawl and do them all. Going in and out of the best bars in the city, you enjoy creative cocktails and meet other party goers as you ring in the new year with style. Hollywood is a famously fun place to celebrate New Year’s Eve, but it can be hard to know which bars are best. A pub crawl lets you check out some of the hottest bars in town and takes some of the guesswork out of how to pay as organizers help handle the details. A fancier bar/lounge, Press Club’s New Year’s Dance Party has a Latin flair this year. Buy tickets in advance to dance the night away, accompanied by champagne and cocktails. You can nibble on small bites with a limited menu and be sure to dress to the nines for full experience. Smuggler’s Cove is usually a cozy spot to enjoy a variety of rum cocktails in a tiki setting. For New Year’s, you’ll want to snag your tickets in advance because a lot of people like to enjoy rum paired with fun in one of the country’s best cocktail bars. 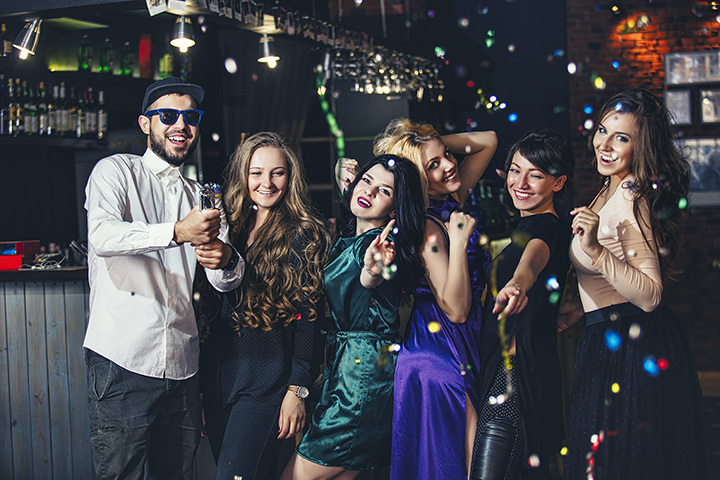 San Francisco’s NYE events often come with a dress code but you can dress up as much or as little as you like at the Sip Bar & Lounge New Year’s Eve party. A DJ will be on hand to mix it up with tunes to help you get grooving and your ticket allows you to go in and out so that you’re not stuck inside all night. Although you may want to stay in so that you don’t miss out on party supplies like hats and complimentary champagne.